I have been reading the quite excellent free magazine called Full Circle Magazine since it started. It is oriented towards Ubuntu users and covers software reviews and introductory tutorials on programming. 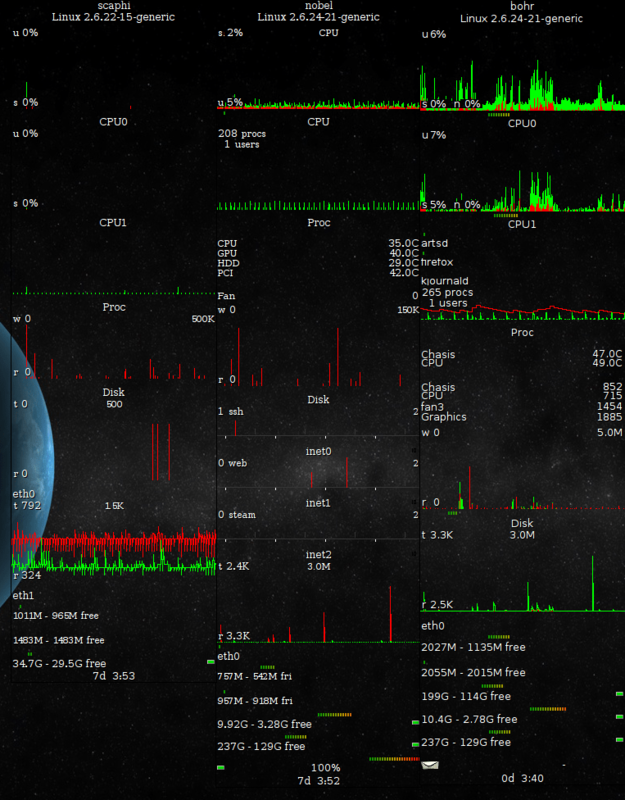 It is easy to clutter a desktop with lots of terminal windows when working with Linux on different machines. To solve this problem I use yakuake which is a dropdown console like the one found in the game Quake. Whenever I need a shell I press F12 and yakuake drops down from the top of the screen. Just as the normal konsole yakuake supports tabs (Shift-Ctrl-n creates a new tab) so only one instance of yakuake is needed. I like to monitor a couple of linux servers and I really enjoy the gkrellm as it gives me a visual presentation of the cpu, disk and net load on the different servers. It is a bit James Bond sixties like but it really makes sense – with a glance I can see if there is any problems on any of the machines. Life feels empty without this program. Invisble theme is my favorite theme for gkrellm. gkrellmtop shows the 3 most cpu intensive processes. Download top.so and put it in the folder /home/tjansson/.gkrellm2/plugins/. Hi Thomas Jansson, can I know how to set gkrellm layout just like it’s shown in the picture.